It is appropriate that Ron Wragg should start this series as he has provided many of the illustrations for the magazine. He does not charge for this work and has given the RDA the copy write. Currently, we do not have all his pictures and consequently the need to repeat the ones we do have has not done his work justice. Ron is also a wood carver. Three examples of his work are below (double click on the images to enlarge). In 2006 he wrote: ‘My affair with Deben began in the mid 1950’s. I was a teenager and a pal of mine suggested a jaunt. I rode pillion on his motor bike and went for the first time to Felixstowe Ferry. I was a town boy, brought up near the busy Ipswich Docks, full of majestic Thames barges. By contrast Felixstowe Ferry with its little fishing boats looked quaint and old fashioned, and pleasantly scruffy. I recognised the hulls of half a dozen old flying boats, wingless and propped up on the shore where now the house-boats are moored. I still found them exacting because I loved aeroplanes. We wandered round, lost in a world that seemed slow and comfortable, governed by tides and not clocks. 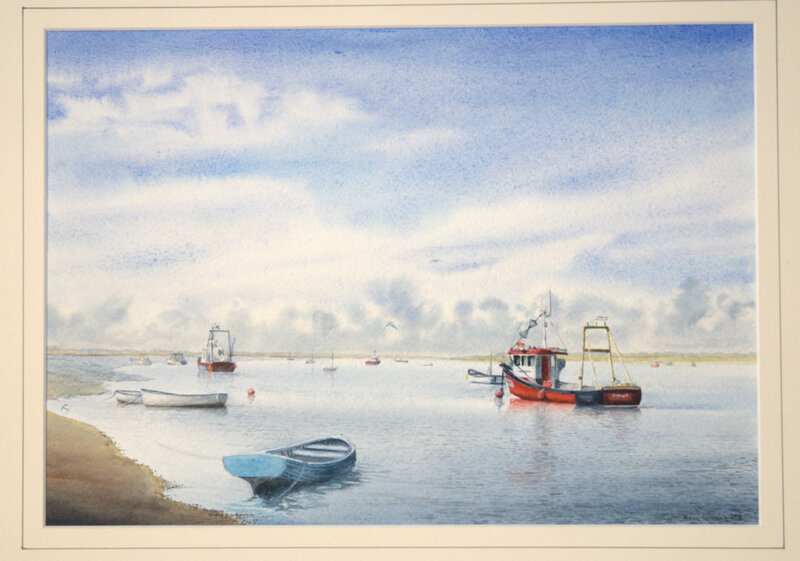 ‘Living in Bawdsey and working full-time at Felixstowe Ferry Boatyard requires a commute by rowing boat or a long drive on stormy days, however, my part-time occupation is based at my studio Butley. I paint mainly in oils, the majority of my work being depictions of elements within the coastal landscape, both locally and, and on the Hebridean Islands which I visit annually. 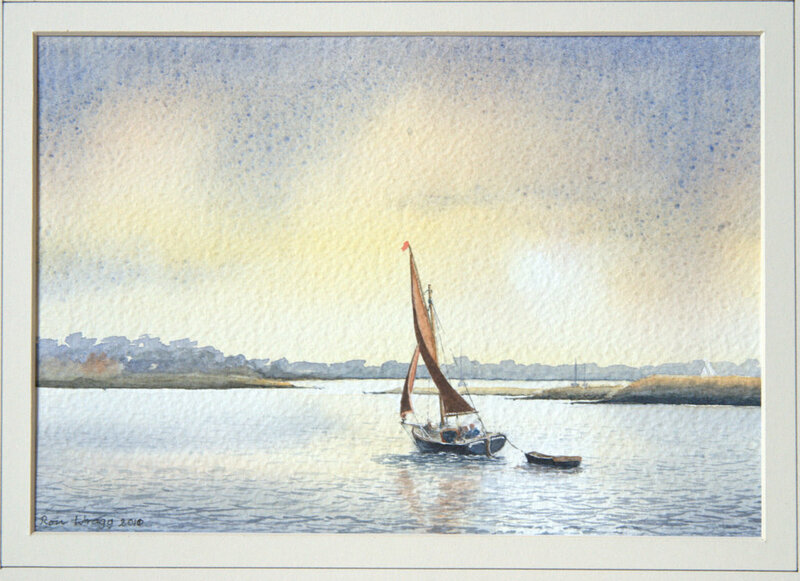 In the mid 1990’s I acquired a mooring at Ramsholt having sold Twinkler, and moved on to a more manageable craft. 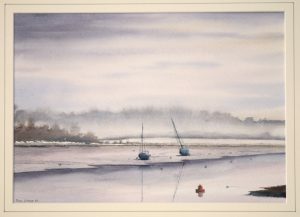 Over the years the intrigue of the Deben, changing light and amazing colours has inspired me to paint every aspect of the river. 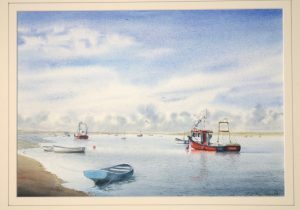 In future the magazine will feature artists including Simon Read, Margaret Wyllie, Hugh Webster (who paints from a hut at Felixstowe Ferry and who has an exhibition at the Peter Peers gallery starting on the 11 October). 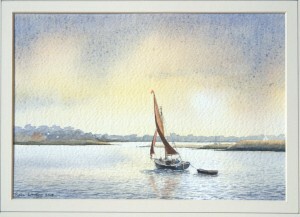 John Barham, Paul Reeve who has painted the Ferry on many occasions, Caroline Poole and others.